Huge Savings Item! Save 17% on the External CD DVD Drive, VersionTECH. USB Ultra-slim Portable CD DVD RW/DVD CD ROM Burner/Writer/ Superdrive with High Speed Data Transfer for Mac Macbook Pro/Air iMac Laptop by VersionTECH. at Pacs BG. MPN: 4328437233. Hurry! Limited time offer. Offer valid only while supplies last. 【WIDE COMPATIBLE SYSTEM】- Compatible with Windows 98 / SE / ME / 2000 / XP / Vista / Windows7/ 8/ 10/ MAC OS. Specially designed for MacBook, Ultrabook, Laptop or PC without internal drive. 【PLUG AND PLAY】- No driver and external power required, powered by the USB port. It's easy to use as the shot-in design, no eject button. 【UNIQUE INTELLIGENT TECHNOLOGY】- Embedded cable design, made with premium wire drawing material of shockproofing, low noise, anti-interference and high durability. works well in burning, writing and reading. 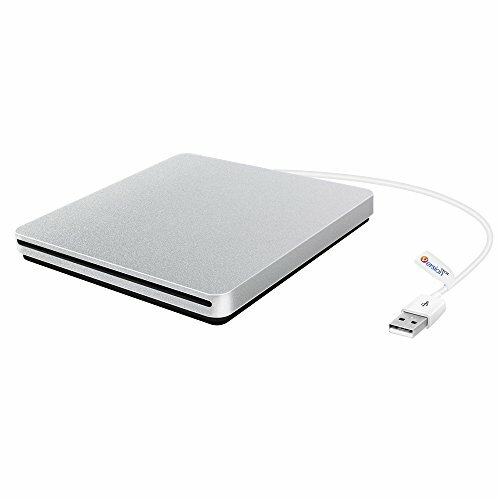 【ULTRATHIN &PORTABLE】- Ultra-slim portable DVD drive, lightweight, you can put it in the travelling bag or on your desk, which only needs a little space. Really Very Conveniently! 【WARRANTY &SUPPORT】- We offer a 45-day full refund guarantee on all our products, as well as a 1 year warranty. If you have any problems with our product or service, please contact us and we promise to resolve the issue within 24 hours.